Despite 24 years passing since their Eurovision Song Contest victory, a serious tour accident and legal battles, Bucks Fizz have re-grouped and become the subject of a dark new comedy show. The band was formed to represent the UK in the 1981 contest, winning with Making Your Mind Up and a dance routine that involved Mike Nolan and Bobby G pulling the skirts off fellow band-members Jay Aston and Cheryl Baker. Their Eurovision success led to 13 hit singles as their winning song was followed to the number one spot by Land of Make Believe and My Camera Never Lies. Bucks Fizz survived a tour coach crash in 1984, in which Nolan was seriously injured, but Aston quit the following year in acrimonious circumstances. A new line-up secured just one further hit, 1986's New Beginning. The band's glory years have been revisited in A Night of a Thousand Jay Astons, a surreal new show to be performed at the Edinburgh Fringe Festival after a successful east London debut. Led by cabaret star Jonny Woo, one female and three male performers play the wavy-haired Aston as she enjoys and suffers the effects of pop stardom, blending fact with fiction against a Bucks Fizz soundtrack. Aston's modelling aspirations are explored during Land of Make Believe, the song Run For Your Life accompanies the coach crash scene and Aston is shown feeding chocolate eclairs to band rival Cheryl Baker to make her gain weight. "I've been a Bucks Fizz fan since they won Eurovision, but it became a dark secret as friends moved onto bands that were more cool," says Woo, who doesn't let the fact he has a beard prevent him from playing Aston. "Jay was always my favourite. She was much more sexual than the others - the removable skirts were her idea," he says. "Jay wrote the book on how to pout. She didn't smile in a single Bucks Fizz photograph." Originally planning a straightforward Bucks Fizz musical, Woo made Aston the star after finding her at the centre of all the "drama, tension and jealousy" within the band. 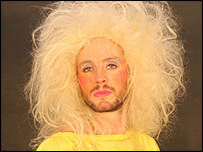 He feels an Edinburgh audience will be more than ready for a Bucks Fizz show. "There's so much drag on TV shows like Little Britain nowadays, no-one's going to be horrified by a few men lip-syncing to My Camera Never Lies." The real Jay Aston now acts and performs with her own group Aston, runs stage schools for children in Hayes and Sevenoaks in Kent, and is writing her autobiography. She has not seen A Night of a Thousand Jay Astons but says she is intrigued by the idea. "What a great name for a show," she says. "I am loving that I am the central character." Aston says she is unsurprised that the history of a manufactured 1980s band has formed the basis of a show in 2005. 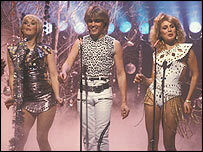 "The Bucks Fizz story is forever unwinding like a cork about to pop. "The story has many versions and agendas, is dark and long and still writing itself." Her ex-bandmates continue to perform in two separate versions of Bucks Fizz - the four-piece Bucks Fizz (headed by Bobby G) and the recently-formed trio Cheryl, Mike and Shelley (featuring Cheryl Baker, Mike Nolan and Jay Aston's replacement Shelley Preston). Ex-Dollar star David Van Day also performs the band's hits in a group called David Van Day's Bucks Fizz Show, after settling a legal fight for the Bucks Fizz name with Bobby G in 2002. "It's become very confusing for fans, who don't know whether they are going to see the real or pretend Bucks Fizz," says Ian Stocker, who runs fan website Bucks Fizz the Early Years. Stocker believes Bucks Fizz will soon be positively re-evaluated in the way that interest in Swedish pop group Abba was renewed in the 1990s. "Last year all the original members of Bucks Fizz, except Jay Aston, reunited for the Here and Now UK tour and the reception they got onstage was amazing. "It would be fantastic if they all got back together for the band's 25th anniversary next year, but I don't think that will ever happen." Cheryl Baker, who left Bucks Fizz in 1993 after becoming a TV presenter, confirms on Stocker's website that a reunion with Aston is extremely unlikely. "If you didn't get on with someone you worked with, would you particularly want to meet up with them again 20 years on to see if your opinion had changed?" she says. "While people are still interested in Bucks Fizz it will keep going," Jay Aston concludes, "though only certain parties reap many benefits."